We invite you to preview highlights from Volume 100, Number 3 (Summer 2014) of the Catholic Historical Review. 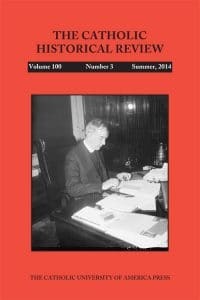 On this page you can browse abstracts and excerpts from articles and reviews appearing in the Catholic Historical Review. Abstract: Papal impact on peripheral areas in the Middle Ages depended on the means of and possibilities for communication. This case study of the Livonian crusade and mission in the first half of the thirteenth century demonstrates the difficulties of implementing a central leadership in an area that lacked established communication patterns with the papal curia. Traveling was expensive and depended completely on the seasonal rhythm of navigation. To receive a papal letter presupposed personal attendance at the curia; in addition, the papal legates in the Baltic did not establish a regular system for exchange of information. Another important reason leading to this situation was the absence of personal networks that could connect Rome and the Baltic region. Abstract: Claude Martin’s Vie de la Vénérable Mère Marie de l’Incarnation claims to reproduce so faithfully Marie de l’Incarnation’s spiritual autobiography that Claude’s voice in the text is “but an echo” of his mother’s own. A close reading, however, suggests that Claude so dominates the account of his mother’s life that the Vieemerges as an instance of hagiography and apology that renders Marie the model of the Counter-Reformation saint, the paradigm of post-Tridentine Catholic devotion, and the obedient daughter of a patriarchal ecclesiastical hierarchy in an effort to draw the boundaries of female religious identity in early-modern New France. Abstract: This article describes the processes that culminated in Pope Pius XI’s historic 1926 consecration of the first native Chinese Catholic bishops of modern times. Since the first Chinese bishop had been named some 250 years before, the many obstacles that prevented the naming of new native bishops in the intervening centuries are explored. Spurred by progressive missionaries, the Church embarked on a reform program to indigenize the Catholic episcopacy in China. In doing so, the Holy See had to overcome opposition from powerful constituencies. A brief portrait of the six bishops provides insight into the reasons why Rome decided on this particular group of candidates. Abstract: In 1915, the United States landed marines in Haiti, a Catholic nation tied by concordat with the Vatican. In 1921, Paulist priest John J. Burke, general secretary of the National Catholic Welfare Conference, began lobbying the federal government on behalf of the Church in Haiti. From 1925 through 1931, he served as official representative of the Vatican and Haitian hierarchy to that government regarding the occupation. The author recounts Burke’s efforts for the Church in Haiti that culminated in the American government’s decision to withdraw from the island nation. Abstract: In his efforts to challenge Poland’s communist regime and shape the thinking of his countrymen on a variety of spiritual, moral, and political issues, Pope John Paul II made generous use of the saints. This article examines Ss. Wojciech, Stanisław, Hedwig, and Maximilian Kolbe, who figured prominently in John Paul’s addresses to Poles during his dramatic visits to his homeland in June 1979 and June 1983, and the ways in which he employed them on behalf of his campaign to encourage, instruct, and succor his fellow Poles.